. We are excited to announce that Google Map Maker is now available for South Africa and Egypt. With Google Map Maker, you can contribute your local knowledge to make a more detailed and comprehensive map of the changing world around us. Begin in your neighborhood and try adding the building footprints for all the restaurants along the beach, updating the one way street that just recently became a two-way, or mapping the local stadium before heading off to a game. Once approved, your contributions will appear on Google Maps, Google Earth and Google Maps for mobile, accurately reflecting your real-life neighborhood. Giza Zoo near Cairo University comes to life in Google Maps. Is your local park already on the map? You can also create the outline of the nearby lake and tennis courts, add important details about your favorite historic sites, or map the walking paths through the public gardens. Help tourists explore your town by editing road details so visitors can find their way to all the premier destinations. Join with other local mappers and use your local expertise to review one another’s contributions to the map. Google Map Maker warmly welcomes South Africa and Egypt mappers to the team of citizen cartographers from across the globe as they continue to build the world map. We’ll continue our expansion over the next month to the following countries as well: Australia, Austria, Belgium, Denmark, Finland, Liechtenstein, Luxembourg, New Zealand, Norway, and Switzerland. Stay tuned for additional announcements with the Google Maps page on Google Plus, learn more on the Map Maker YouTube Channel, and get started mapping today! From the wild grasslands of Kruger National Park to the the extraordinary pyramids of Giza, the world is ripe with wonders waiting to be explored. It’s time to share the beauty of your country by adding and updating the places you care about in Google Maps. 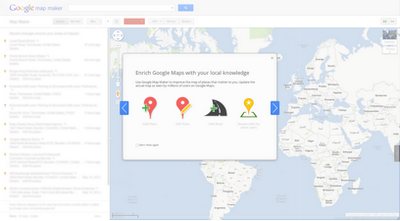 We are excited to announce that Google Map Maker is now available for South Africa and Egypt.